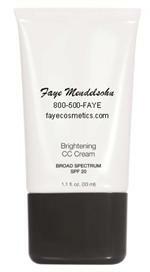 Faye's CC Cream for ALL complexions. Corrects skin tone, blurs imperfections. Reduces redness. Provides broad spectrum SPF 20. Apply to face prior to foundation or bronzer. This self setting foundation and powder in one is infused with powerful anti-oxidants and minerals which protect and hydrate your skin. 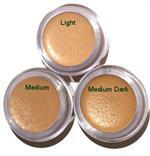 Oil free, hypoallergenic for all skin types. Select Faye's Special Colors. A shimmering tinted cream that primes, nourishes and evens skin tone. This protecting cream has broad spectrum SPF 30. 1.1 fl. ounce. This colorless, light weight serum with Sunscreen SPF 20 evens skin texture, minimizes imperfections and protects against UV damage. Extends foundation wear. 1.0 ounce. This lightweight liquid foundation is luminous and irresistible. It diffuses light for a glowing, natural look. Broad spectrum SPF 15 protection. 1 fluid ounce. A creamy smooth concealer for coverage of difficult imperfections and blemishes. 0.25 ounces. This ultra-light SPF 20 tinted moisturizer creates the perfect canvas for beautiful makeup colors. Natural beige color. 1.1 ounces. Powder Combo is a versatile, matte finish, oil-free powder that covers imperfections and keeps your face looking fresh. For best results apply with a Luscious Dome Brush.